Begun in 1998, seven years after the similarly popular Gay Days at Disney World in Florida, the continuously growing Gay Days Anaheim brings around 35,000 GLBT revelers to Southern California's noted Disneyland resort and theme park, which has been delighting revelers of all ages since it launched back in 1955, forever transforming the previously quiet and little-visited local landscape. This festive event takes place over the first weekend in October, with the dates this year from September 30 through October 2, 2016. If you're in the area in late June, also be sure to check out Orange County Gay Pride in nearby Santa Ana - it takes place this year on June 25, which is a change from previous years, when it had been held in July or August. 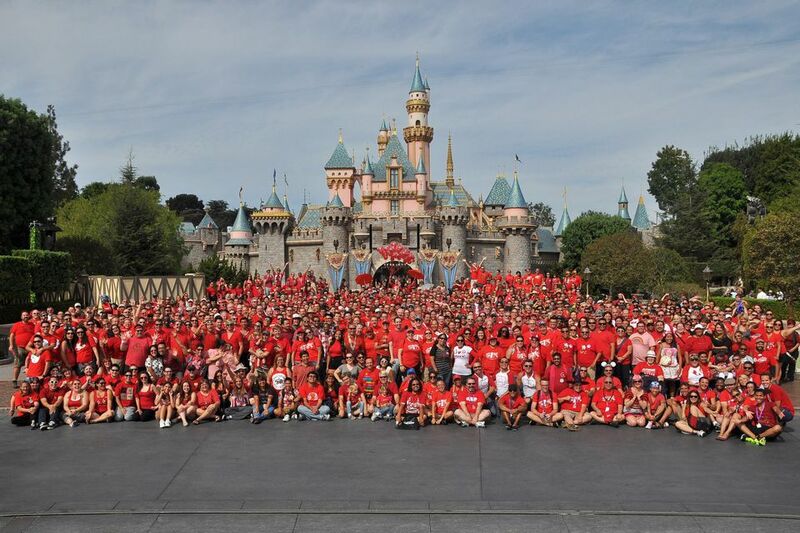 As with the original GLBT Disney gathering in Orlando, Gay Days at Anaheim is not an official Disney event - the park remains open to all throughout the weekend, and GLBT attendees typically wear red shirts to indicate their participation. That all being said, the event has been going strong for years, and everybody tends to get along quite well. Events over the three days kick off on Friday, and throughout the three-day weekend, you can pick up the latest information on the event by visiting the Gay Days Info Center in the Trillium Room at the Grand California Hotel and Spa. The center is open until 8 pm on Friday and Saturday, and until 3 on Sunday, and at the center you can pick up brochures and information from a number of LGBT-supportive vendors and businesses in the area, including Adventures by Disney, Aulani resort, the Anabella resort, Disney's Fairy Tale Weddings, the Orange County GLBT Center, and several others. There are plenty of activities throughout the weekend, from the opening Wonderland Party at Ralph Brennan's Jazz Kitchen to the Plunge (Sunday) and Kingdom (Saturday) parties to comedy performances, cocktail receptions, and lots more. Check the official Gay Days at Anaheim calendar for details. Other events include movie and TV screenings and opportunities to mingle with LGBT notables and other celebs, and a very popular gay brunch on Sunday morning (last year it was at jazzy and snazzy Ralph Brennan's Jazz Kitchen, right in Downtown Disney). One highlight in 2016 is Saturday comedy performance, Leslie Jordan: Straight Outta Chattanooga, in the Sorrell Room at Disney's Grand Californian Hotel. This is also very much an event that's suitable for families, and many LGBT participants with kids do attend. There's a Family Kick-Off Splash on Friday evening, plus family scavenger hunts, lunches, kids' breakfasts, and more. Other programming has been created for teens (including an LGBTQ youth dance on Saturday night). Also be sure to check out the page on Host Hotels - these include the Grand California Hotel & Spa, Disneyland Hotel, and Disney's Paradise Pier. The Anabella, the Anaheim Majestic Garden Hotel, and the Howard Johnson Anaheim are also sponsors of Gay Days at Anaheim. These three offer special rates during the weekend, which you can link to from the official host hotels web page. As you might expect, the gay bars in the area along with a number of popular restaurants, hotels, and shops have special events and parties throughout Anaheim Gay Days weekend. Gay-specific media in the region include Rage Monthly, which is based in San Diego but does have some coverage on Orange County. Also check out the excellent travel site produced by the Anaheim/Orange County Visitor & Convention Bureau. Anaheim is also part of metro Los Angeles, and you'll find plenty of additional information for GLBT travelers headed to this area by consulting our Los Angeles Gay Guide, West Hollywood Gay Guide, and Santa Monica and Venice Gay Guide. You'll find tips on where to dine and go out in these online guides as well as in the Silver Lake Los Angeles Gay Nightlife and Dining guide. Another very popular event in this part of the state is Long Beach Gay Pride, which takes place earlier in the year, in May - here's a preview of that celebration.